Whereas the first trailer for Dreamworks' Monsters vs. Aliens played like Hellboy rejiggered for preteen boys, the film's just-released second preview actively courts the young female quadrant by focusing heavily on Reese Witherspoon's Attack of the 50-Foot Woman--type character. But while we are treated to a few more details about her character's arc -- she gets hit by a stray meteor on her wedding day, causing her to swell to ginormous proportions, at which point the U.S. government forcibly enlists her to assist with national security issues -- we still don't get the sense that this movie will be as awesome to watch in 3-D as the upcoming My Bloody Valentine remake (MBV3D for short). Also, we would be remiss if we didn't inform you that Seth Rogen's amorphously blobby character does appear to find himself a love interest at some point in the film. 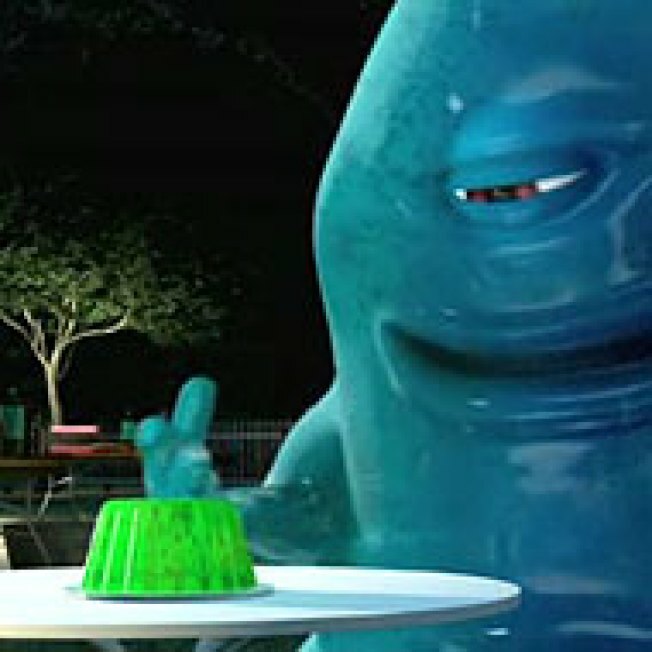 Specifically, a Jell-O mold. Heck, that beats a pie any day of the week! Is Will Smith Really an Outlier?